When Philips moved its headquarters from Eindhoven to Amsterdam a couple of years ago, a number of empty factory buildings were left in its trail. But now these dead spaces are undergoing a transformation, being revitalized into lively hubs where the community can gather and play. One example of this revitalization comes in the form of AreaFiftyOne, a cool indoor/outdoor skate park constructed almost entirely from local wood. 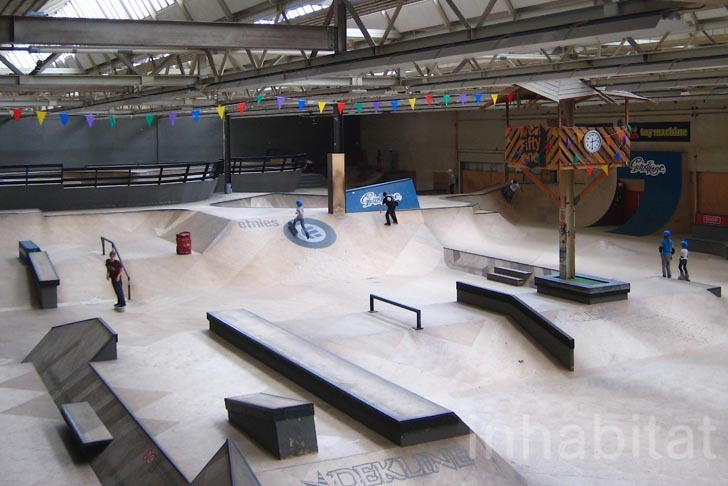 With a total floor area 10,000 square feet, this grand skate park is one of the largest of its kind in all of Europe! AreaFiftyOne skate park was first opened to the public in an old hangar in the Dutch city of Meerhoven, and in 2006 it moved to its current location in one of Philips’ old factory buildings at Strijp-S, Eindhoven. Flooded with natural light, AreaFiftyOne offers skate lessons, workshops, a bar, DJ’s and live performances that range from hip hop to punk, and experimental to Drum & Bass. Different areas like a flat U-shape cross-section and a MU-bowl have been designed for kids to experiment and practice freestyle, street and transition moves. The outdoor skating area has a couple of tree-trunk supported poles for practicing tricks (inspired by Droog Design’s Tree-trunk benches, perhaps?). 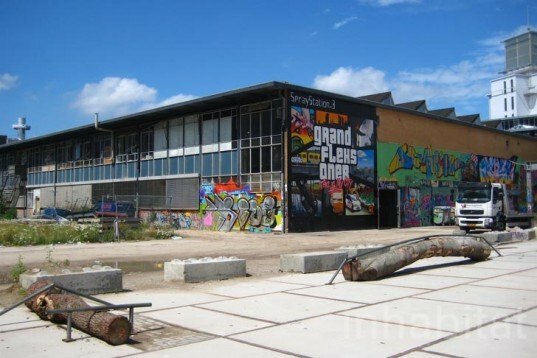 One of the coolest spaces to hang out in Eindhoven, AreaFiftyOne Skatepark is the perfect space for young kids and adults to test out some tricks on wheels. AreaFiftyOne skate park was first opened to the public in an old hangar in the Dutch city of Meerhoven, and in 2006 it moved to its current location in one of Philips' old factory buildings at Strijp-S, Eindhoven. Flooded with natural light, AreaFiftyOne offers skate lessons, workshops, a bar, DJ's and live performances that range from hip hop to punk, and experimental to Drum & Bass. Different areas like a flat U-shape cross-section and a MU-bowl have been designed for kids to experiment and practice freestyle, street and transition moves. The outdoor skating area has a couple of tree-trunk supported poles for practicing tricks (inspired by Droog Design's Tree-trunk benches, perhaps? ).